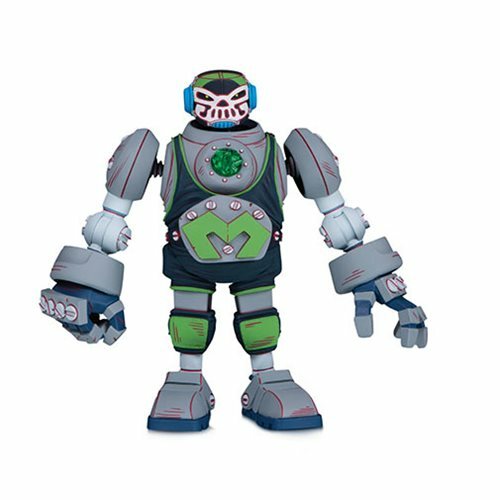 This DC Comics Lucha Explosiva Metallo Action Figure stands 7-inches tall, made of plastic, and features multiple articulation points for custom poses. Metallo features fully articulated digits on his hands, giving fans extra posability. This rough-and-tumble wrestling machine is one of the most unique and most accomplished luchadores on the circuit. With the rescued brain from a second-generation luchador controlling a frame that proudly displays its "Hecho en Mexico" stamp, this massive machine has won many fans' hearts, even if he doesn't have one of his own. Taking his name from a formerly beloved (and human) luchador, Metallo II is a perplexing matchup for his opponents in the ring. His build - rumored to be designed by lucha-obsessed students at a nearby university - features extra-long arms and oversize feet, which present a formidable challenge to the Tecnicos who don't want to be accused of fighting dirty. As such, he is currently the only wrestler on tour who has not been defeated by Superman. Tecnicos! Rudos! Superhero and wrestling fans "A la lucha!" The wrestling collectible event of the year is here! From the team at DC Collectibles comes a joyful and imaginative universe that combines the enthralling world of Mexican wrestling and the heroic history of DC Comics: DC Lucha Explosiva! The 7-inch scale action figure line takes its roots from the deep history of Lucha Libre and Mexican Luchadores. Each figure is a Latin American-inspired reimagining of a classic DC Hero or Villain, complete with a backstory drawn from Mexico's rich cultural history.